Our family has a grandfather clock that was made at our father's shop in Martinsville. Our father B. C. Lipford and his friend Sam Fishel moved to Martinsville about 1921 and established the L & F Repair Company on Chestnut Street. There was a clock that chimed at the Shop. One day my sister, who was very young at the time, was trying to count the strikes. Green Gravely, an employee there, asked her what time it was, and she told him thirteen o'clock. He loved telling that story. The shop was known for its antique furniture reproductions that were handmade. J. C. Wooldridge's daughter Ann recently told us that when her father first came to Martinsville and worked as bookkeeper at L & F Repair, he learned how to make furniture and made several pieces for his family. Our neighbor on East Church Street, Henry Grogan, called our father in the early 1940s and told him that he had two clockworks. He asked Daddy to build two grandfather clocks, one for each of them. 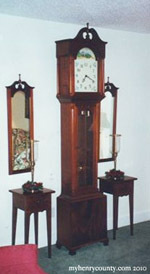 The two grandfather clocks were built at the shop. Daddy also made tables and mirrors to place on each side of the clock. George Schlueter, who owned Schlueter Electric Company in Collinsville, was an artist and painted the faces on the two clocks. His grandson Randy told us that Mr. Schlueter painted several Baptistry backdrops for churches, including Fieldale Baptist Church and Bassett Church of the Brethren. He is most remembered for his portrait of Patrick Henry that hung in the old courthouse. Our grandfather clock was placed at the end of a long hallway in our house. Only Daddy was allowed to wind up the clock. I can remember lying in bed and listening to him wind that clock up, slowly lifting up the three weights with the chains. I began to associate the clock with my father, tall and strong, and still do to this day. We loved to listen to the clock strike four notes on the quarter hour, eight notes on the half hour, twelve notes on the three quarter hour, and on the hour chime sixteen notes and strike the hour. We also enjoyed watching the pendulum swing back and forth, almost hypnotic in its movement. The grandfather clock brought a warm, cozy feeling to our home. We now own the grandfather clock, and it is a family treasure. When we moved back to Martinsville, our high school friend Jesse Yarbrough did repairs on the clock. He told us the clockworks were made in England. Jesse died last Fall, and we will miss him coming to repair our special grandfather clock. The grandfather clock stands in our living room, a constant reminder of our wonderful father who made it so long ago.